Take Whiterun in the name of the Stormcloaks. Leveled enchanted weapon; title of "Ice-Veins"
The Stormcloaks begin their advance on the city of Whiterun. Get your orders from Ulfric. Meet the Stormcloaks preparing for the attack. Defeat Jarl Balgruuf the Greater. After finishing the previous quest, Jarl Ulfric Stormcloak will tell you that you are going to help take Whiterun. Report to Galmar Stone-Fist for orders, who will direct you to meet him outside the city. 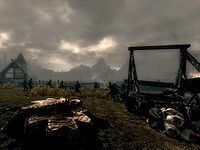 Head to the Whiterun Military Camp, southwest of Whiterun, and you will notice that the besieging of Whiterun has already begun. Head to where Galmar is briefing the men on the attack and listen in. He will say your destination is the drawbridge that has been raised to keep the attackers out. Once the rallying of the troops is done, charge in with Galmar and the troops. Don't worry too much about killing all the Imperials, as more spawn. When you reach the first set of wooden barricades is also when you meet the first enemies. Breaking through the barricades is easy. Hit them a few times with a weapon and they break. Your journal will then tell you to lower the drawbridge. Move up the path to the small wooden bridge with the stone walls to your side, head up there, and go up the walkway. You will see two drawbridge levers over the drawbridge. Pull one. The bridge will fall, and the soldiers will run into the city. ...which is quickly overwhelmed by the Stormcloaks. Head into the city. Your destination now is Dragonsreach (It may be safer to stay with Galmar and the soldiers). Several barriers block the entrance to the plains district, which are destroyed after 3 blows from any weapon (power attacks make no difference). Upon entering Dragonsreach, three soldiers will charge at you, but they will die easily. Continue up the stairs, where Balgruuf will shout about not letting you take the city without fighting back. Then he, three guards, and his Housecarl, Irileth, will attack you. Kill the soldiers. After the jarl is reduced to 25% health, he will stop the fight and surrender. Vignar Gray-Mane will approach the jarl and they will have a short conversation. Galmar will stop the conversation after a while, Vignar will walk off after a few more words and Balgruuf will address you for a minute. With Balgruuf stepping down, Vignar takes the throne as the new Jarl of Whiterun. The quest will end there and the next quest, Liberation of Skyrim, will begin. When you return to Ulfric Stormcloak in Windhelm, he commends you for the victory and rewards you with an enchanted leveled weapon and gives you the title "Ice-Veins". The Whiterun Guards faced in this battle are significantly lower level than those normally patrolling the city. Bodies will quite often disappear during this quest - this is intentional to reduce lag and is not a bug. After the battle, if you have an outstanding bounty in the Whiterun Hold, it will be erased. This quest, Battle for Whiterun (Imperial), Battle for Solitude, and Battle for Windhelm are all different radiant versions of the same quest. From here on, Stormcloak Soldiers will take over as guards of the Whiterun Hold, though Whiterun Guards will continue to patrol Riverwood. Whether this is intentional or not is unknown. Taking the carriage directly to Whiterun automatically skips the objective to "Break through the Enemy Barricade". After getting your orders at the Whiterun Military camp, you can head straight to Windhelm. The battle will be won in your absence, but Ulfric Stormcloak will be disappointed that you ran away. Severio Pelagia dies at the beginning of this quest. If LuciaHF has been adopted, she will be transferred to the Bannered Mare until after the battle is over. This happens because her editor location is there and CWCitizensFlee will pick her up in one of the aliases. The Bannered Mare will have a barricade across the main entrance and both doors will be expert locked, however if you pick the lock, both Hulda and Saadia will have their normal speech options, welcoming you and are willing to trade. Breezehome becomes locked again, key required. Honningbrew Meadery is apprentice locked during this battle, however if you pick the lock Sabjorn will be back in charge with both him and Mallus Maccius telling you to get out and treating you as if they don't know you. You are unable to trade with either of them. You will be unable to enter Jorrvaskr during or after the battle as all the doors require a key. Unused files suggest Jarl Balgruuf the Greater was intended to flee the battle through a secret passage located behind the throne rather than stay and fight. Stealing items causes a bounty to be applied to Eastmarch rather than Whiterun. After defeating the Jarl and getting him to surrender, the quest pointer may continue to point to him, but no interaction is possible and the quest does not update. Striking the Jarl and then paying off the bounty may fix this. The doors to Jorrvaskr and the Underforge will become locked during this mission, and may not unlock after it's completed. Since the doors require an unavailable key, this renders the buildings (as well as the Companions inside) inaccessible to you. You can unlock the doors using the unlock console command. 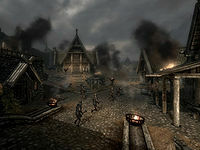 Fast-traveling to any town then back to Whiterun may resolve the issue. You may not be able to break barricades as a werewolf. Aela the Huntress may disappear if she is your wife at the time. She may come back eventually after you have moved on to the next quest, Liberation of Skyrim. 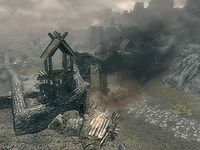 Receiving the quest update "force Jarl Balgruuf the Greater to surrender" may cause the game to crash upon entering Whiterun or, if the city is entered beforehand, the game may crash immediately upon receiving it. Killing Whiterun guards instead of Imperial soldiers will incur a bounty, though it will be removed after the battle. Entering Chillfurrow Farm during this quest may end it prematurely. ? Upon entering Whiterun, there may be no Imperial soldiers and you may be unable to get Balgruuf to surrender. Ulfric may not give you any orders before the battle, which will prevent the quest from progressing. Upon completion of the quest when you are asked to return to Ulfric, it may not let you continue, and the normal dialog will appear. If the battle music is still running and fast-travel is disabled for Whiterun, fast-travel to Pelagia Farm. If that doesn't fix it, go to Dragonsreach and wait until it completes. The completion of the battle music also completes the Battle for Whiterun quest properly and solves most issues with the Civil War questline. Try this before using any console commands. Only the quest stages and objectives that are possibly relevant to this radiant version of the quest are shown. 1 Ulfric Stormcloak has ordered me to join Galmar Stone-Fist in taking the city of Whiterun. The following empty quest stages were omitted from the table: 9999. On the PC, it is possible to use the console to advance through the quest by entering setstage CWSiegeObj stage, where stage is the number of the stage you wish to complete. It is not possible to un-complete (i.e. go back) quest stages, but it is possible to clear all stages of the quest using resetquest CWSiegeObj. This page was last modified on 19 May 2018, at 14:08.